Army and Royal Air Force Air Cadets from Dover and the surrounding area joined Her Majesty’s Lord-Lieutenant of Kent, The Viscount De L’Isle MBE and other local and military dignitaries at the official opening of their new Joint Cadet Centre at Dover, on Thursday 19 April 2018. 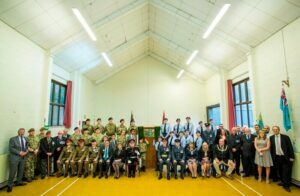 The new Joint Centre is now home to approximately 80 Cadets and also the B Company Headquarters of Kent Army Cadet Force. The building previously accommodated a Dover-based Reservist Platoon. The converted construction is based on the current MOD Cadet designs for these centres and has resulted in the internal renovation of the existing Reserves Centre buildings and includes a large Drill Hall, classrooms, kitchenette, toilets, the existing indoor small bore target rifle range, administrative offices for the adult personnel, and store rooms. Each of the three units have separate accommodation but with some sharing of the communal assets. Dover has had a long history associated with the Armed Forces and, under the direction of the Army 2020 Basing Review, the Reserves and the Army Recruiting Organisation were moved out of the area, thereby vacating the Army Reserves Centre. The site has proved to be an ideal location to operate as a more permanent base for the local Army and Air Cadet Forces, which are military sponsored cadet organisations and for the Units concerned to be based at the same place, under the auspices of the South East Reserve Forces’ and Cadets’ Association. These projects benefit the taxpayer, by having a facility that is now in full use throughout the week, together with some weekends. Both the Air Cadets and Army Cadets parade on a Tuesday and Thursday night from 1900-2100. The detachments are always looking for young people and adults to join them and take the opportunity to learn new skills, make new friends and earn qualifications in the process. “We are very lucky at Dover to have such a great building now run jointly with the Air Cadets – it’s a great opportunity for us to learn from each other. It feels like the building has a new lease of life! I’m very proud of my cadets and staff and we were honoured to have the Lord-Lieutenant and other dignitaries in attendance”. 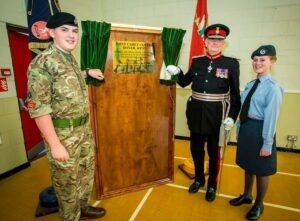 “The opening of the joint cadet centre by the Lord-Lieutenant marks the beginning of a new era for Dover Squadron. With better facilities it offers more opportunities for the cadets and allows for combined activities with Dover Detachment ACF”. After unveiling a wall plaque and declaring the new Joint Cadet Centre open, the Lord-Lieutenant, accompanied by other visitors, toured the Cadets’ accommodation and watched training taking place.